Article first published as Recipe: Chicken Artichoke Alfredo on Blogcritics. The key to this recipe is the light and flavorful alfredo sauce. A touch of sour cream, fresh lemon zest and lemon juice really brightens up what is usually a heavy sauce. Toss in some marinated artichokes, caramelized mushrooms and sautéed seasoned chicken, well then, you've got yourself one tasty pasta dish perfect for spring! The chives just simply add a touch of color and adds a subtle flavor to the dish. 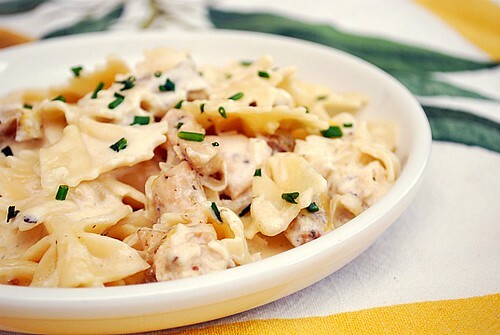 Overall, this is one of my favorite alfredo recipes ever. In a large stock pot, fill with water and cook pasta as directed on package. In a medium bowl, combine the oregano, basil, garlic powder, onion powder, salt, pepper and chicken, tossing to coat; set aside. Meanwhile, melt butter in a large skillet over medium high heat. Add onions and garlic, cooking until translucent. Add the mushrooms and cook until caramelized, about 6-8 minutes. add artichoke hearts to the skillet and sauté until they start to break down. Remove from heat and add sour cream, lemon juice, and lemon zest to skillet and stir. Slowly add 1 cup of heavy cream, stirring to incorporate. Place skillet back on low heat and sprinkle in the cheese and stir until it slowly begins to melt. As it continues to heat, the sauce will thicken slightly. Add 1/4 cup of milk to thin down or more if needed. Drain pasta and transfer into large bowl. Pour creamy sauce over pasta and toss to coat. Plate pasta and garnish with fresh chives. This looks and sounds amazing! I love all the ingredients so I'm sure the finished product is awesome! Gotta love a lightened up Alfredo dish! Yum. I love the idea of balancing the artichoke flavor with the richness of the cream sauce. I'd love to try this! Will it serve about 2-3 people? Emily - yes! It serves 2-3 easily. Enjoy! This looks absolutely amazing! Love the lighter alfredo!